Thanks to reader Richard Biggs who left a comment, pointing out that on page 393 I promised to provide a couple more lists for my Shot, Steel and Stone rules, drawn up by AWI expert Brendan Morrissey! After a bit of frantic searching,I have managed to uncover the misplaced document, which has supplements to the British and American lists that appear in the book, detailing Loyalist and German additions for the British, and French for the Americans. Both lists are for six units each, which could be seen as supplements to the existing lists for larger 18-unit games, or replacements for units in the existing British and American lists. I’d be interested to hear how those of you actually using the Shot, Steel and Stone rules have been getting on. Do let me know if you have any queries: if I can find the time, I’d like to do a series of explanatory diagrams, or even short videos, to help readers to get to grips with the rules, so do tell me if that’s something you’d like to see. To download the list (PDF) go to the “Free Downloads” page as usual, using the password. I have styled the page in the same format as the book, so using a knife and ruler you could cut out the page using the crop marks indicated and slip it inside your copy of the book as page “393-extra”. 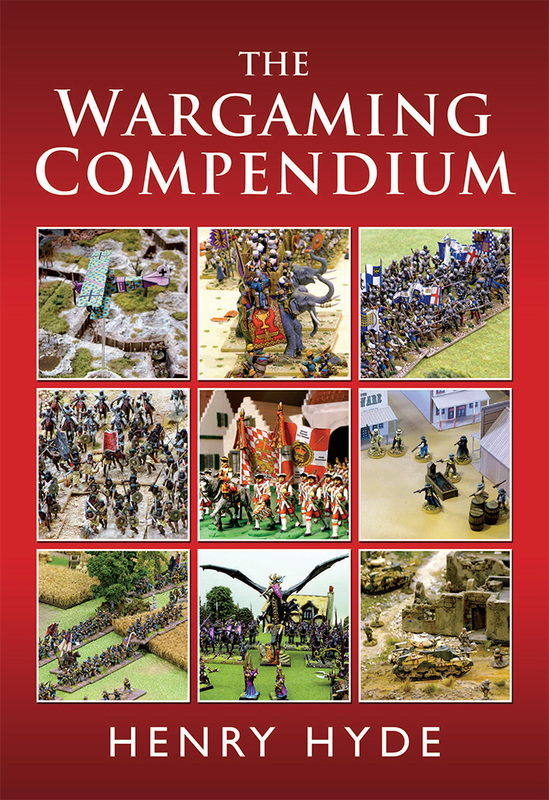 I’m delighted to report that the revised and much improved digital version of The Wargaming Compendium is now available again. It is already available via the Pen & Sword website in both ePub and Kindle formats and will now doubt be appearing on Amazon and elsewhere before long. My thanks to Kariss Ainsworh of P&S for ensuring that the changes I recommended (and there were many!) have been carried out and that the book is back on sale at a fair price (£9) that more accurately reflects the huge amount of work that has gone into its production, whilst still representing a massive discount on the £35 cover price of the hardback. The corrected and updated version is the most attractive Kindle book I’ve ever seen and whether you’ve seen the hardback or not, I think you’ll be impressed with the production values. For those of you who have bought the eBook version of The Wargaming Compendium (that’s Kindle, iBook, Nook etc. ), the revised version with formatting problems eliminated should be released within the next week or so. You’ll also be pleased to hear that I have altered the password hint to enable you to download the free goodies from this site. This now takes into account the fact that the digital versions completely mess up the page numbering! You might also be interested to hear that I have had confirmation from Pen & Sword that they will be doing a reprint of the hardback, which has now almost entirely sold out, and they are also planning to release a paperback version by the end of 2014. Thanks to you all for your tremendous support which has made this possible! I made one ‘house rule’ which I think I have alluded to in the past. This was to give tribal types who have a ferocious charge an advantage in the first round of melee, but a disadvantage in subsequent rounds (due to lack of command and training, general confusion and so on). This took the form of a Disruption Point for receivers of ferocious charges at impact, and then one for the chargers themselves in all subsequent rounds. It seemed to work well and not be overbearing, whilst giving a ‘flavour’ to foot troops who seek to break the enemy at first contact. Many thanks to Paul — that’s such a good idea that I’ll make that an ‘official’ rules update and when I get a moment, I’ll include it on the playsheets. I have just uploaded the playsheets for Shot, Steel & Stone to the secure area of the site. Please note that the password has changed and is case-sensitive, so check the “How to access…” page first. One of the problems is that I am simply too close to the rules, and my own playtesting involved all sorts of odd situations that you may never, or only very occasionally, encounter, so you will probably be a better judge of what should stay and what could happily be left off the QRSs. By all means send me feedback and suggestions if you find that a much slimmer version works for you. My thanks to Iain Burt: during a recent visit, he was kind enough to point out a handful of things that I had left off the playsheet and, indeed, needed to make clearer in the rules, so in fact, the playsheets represent the most up-to-date version. This afternoon, I’m going to be interviewed on Brighton’s Radio Reverb by Paul Stones on his In Brighton Monday show. The programme lasts an hour, starting at 17.00 and ending at 18.00. I have no idea what he’s going to ask me, but no doubt the subject matter will revolve around the hobby of wargaming and, naturally, the book! If you follow the link to the website, you’ll see the link to listen to the show live. It will also be repeated tomorrow. It’s amazing how, after all that proofreading and playing, I’m still uncovering little things in the Shot, Steel & Stone rules that I could have sworn were there already, but clearly aren’t! A game with Iain Burt over the weekend uncovered a few little things that had me scratching my head, so I’m grateful to him for giving me the opportunity to sort them out. If you’re interested, you can see the game photos in a Flickr album – we played “Bridge Demolition”, the very first of Charles S Grant’s Table Top Teasers which appeared first in Battle for Wargamers, and which I then reprinted in the Battlegames Table Top Teasers special edition. If you don’t know the scenario, you can download it for free from the ‘Fridge’ section of the shop on my blog. My thanks to those of you who have already sent me questions about the book and, specifically, about the Shot, Steel and Stone rules. How can it be that so many people proofed the book and rules, including some seriously large-scale playtesting, and yet some little things still slipped through the net? Trust me, I’ve had some real Victor Meldrew moments! This week looks like being one of the busiest I’ve ever had – MWBG365 goes to press next weekend, and it includes the Colours show guide, a whole new adventure for me and a lot of extra work! Therefore, please be patient: I shall be back with answers and responses as soon as I can next week, but in the meantime, do keep the questions and comments coming, and huge thanks to everyone who has taken the time to say such nice things about the book on Amazon, various blogs, Facebook, Twitter and forums.